How is charge related to electric force and electric field? There are two kinds of charge, positive and negative. Like charges repel each other, and opposite charges attract each other. 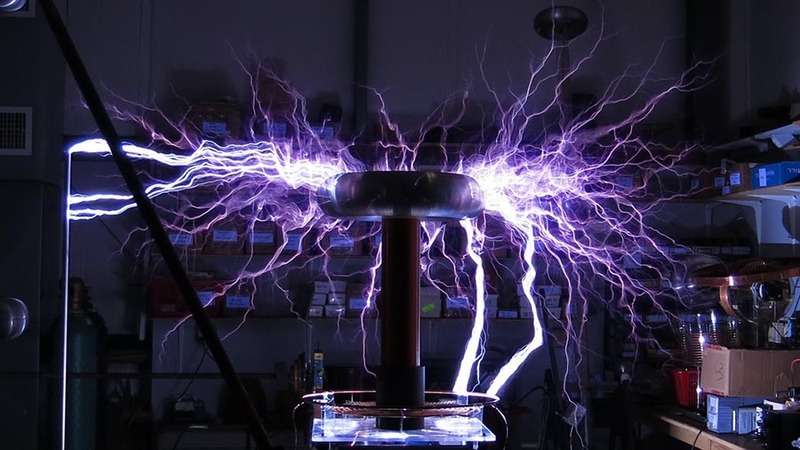 This Tesla coil has such a huge charge built up that the negatively charged particles, the electrons, push so hard against each other that they jump through the air toward positively charged particles (protons). Ancient Greeks discovered that rubbing amber made it attractive. It would pick up tiny bits of straw, but they didn’t know why. The Greek word for amber is elektron. 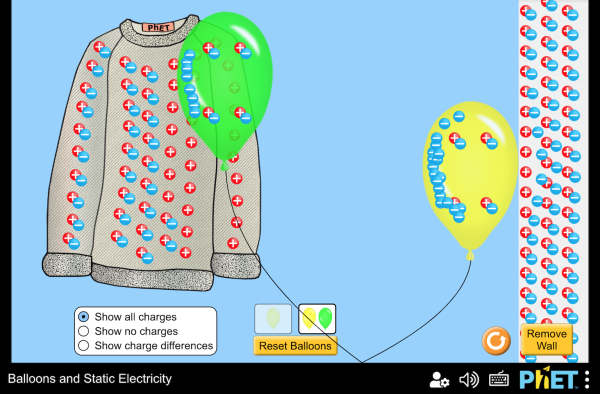 The electron cloud model recognizes that electrons can be viewed as a probability density surrounding a nucleus. Electrons have negative charge by definition, and protons have charge equal to that of electrons but positive by definition. Protons make up atomic nuclei, together with neutrally charged neutrons. Atoms typically have one electron for every proton. When an atom gains or loses an electron, we say it is "ionized." These charged penduli illustrate the fact that like charges repel, and unlike charges attract. The act of rubbing two materials together can result in charging if electrons are more tightly bound in one material than the other. If the electrons are given a path to ground, the excess charge will rapidly leave (discharge). When a charge imbalance is caused by rubbing or touching between two materials, it is called charging by contact. 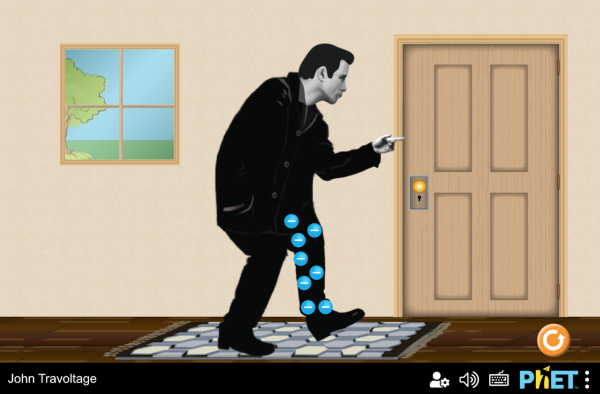 Charge imbalance can also be produced when a charged object is brought near another object, even when the objects don't actually touch. This local effect is called charging by induction. The electronic structure of some kinds of atoms allows their electrons to flow more freely than others. Materials wit freely flowing electrons are called conductors, while materials where the charged particles do not flow freely are known as insulators. A neutral atom has equal numbers of protons and electrons. 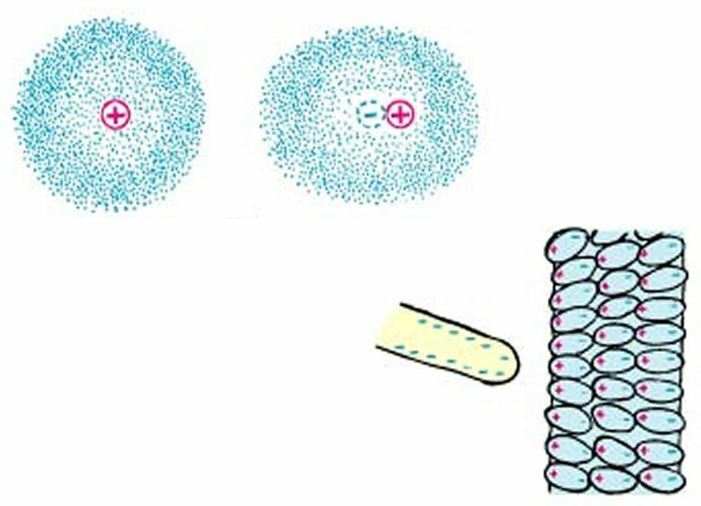 Electrons occupy shells around the nuclei, where shells fill up with a given number of electrons. When a shell is full, the next electron will move to an outer shell. 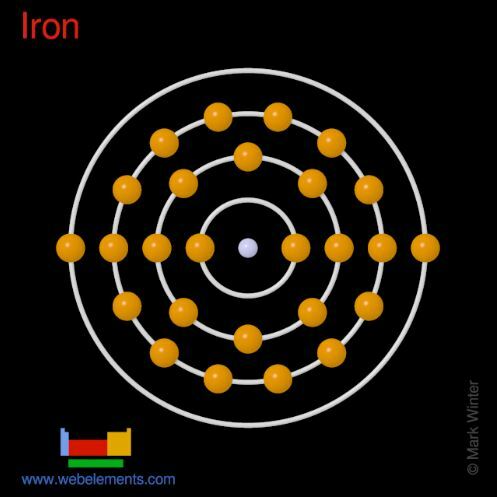 These outer electrons are called valence electrons. They are loosely bound to the nuclei, since they are far from the nuclei and there are electrons shielding the nuclear charges. Atoms are attracted to each other. Their protons and electrons attract each others' electrons and protons. 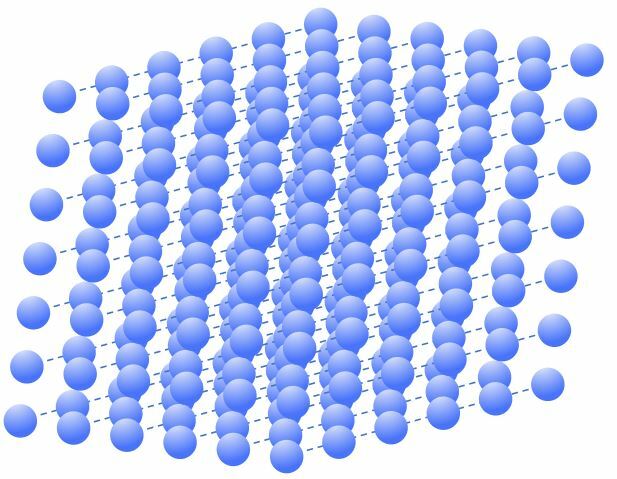 Different metals pack together in different ways, forming a lattice structure. The valence electrons don't really belong to any single nucleus, but are free to flow in the lattice. 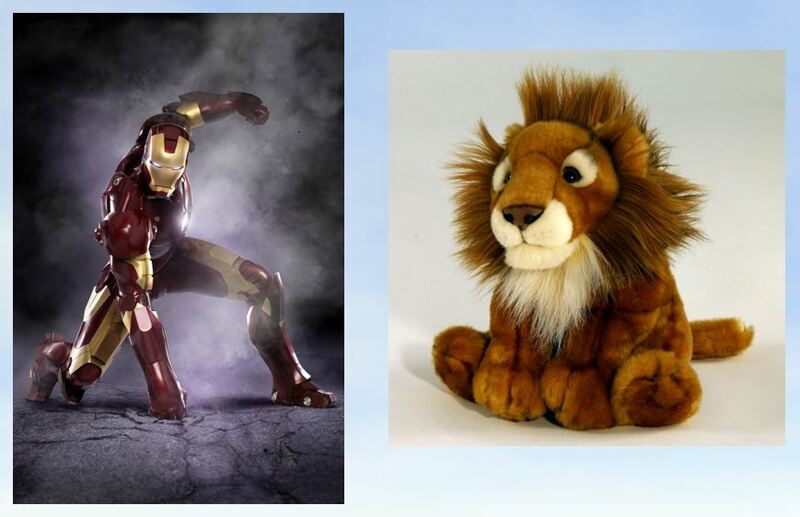 This is what makes a metal a good conductor of electricity. An insulator has no free flowing electrons, and so doesn't conduct electricity well. 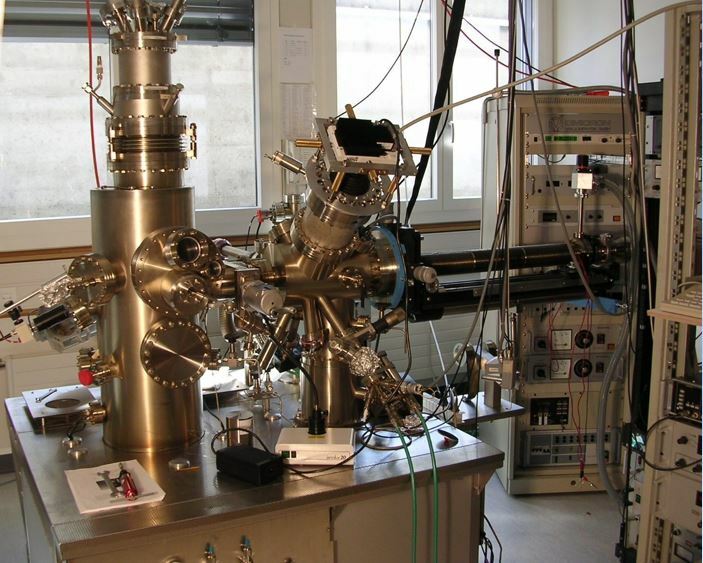 A scanning tunneling microscope (STM) is a sensitive instrument capable of visualizing matter on an atomic scale. It works by detecting quantum mechanical tunneling of electrons. In these images created by a STM, it is apparent that the atomic structures of nickel (left) and platinum (right) result differences in the packing of atoms in the lattice. The wave nature of the electron cloud is apparent in the image on the left of copper with a couple of surface defects. The stucture on the right was created by extracting and placing atoms one by one, using a STM. This structure is known as a quantum corral. An atom can become electrically polarized if a nearby charge causes its electron cloud to become distorted. Polarization can be a widescale effect, often seen in insulators. Polarization can cause electromagnetic attraction in insulators.